Canadian summers are altogether too short. It seems like all I have time for is a couple rounds of golf and a few drinks on the patio before the weather starts turning crappy again. With a couple of snow days common in both April and October, that means summer really only lasts 5 months. I’m not sure what Mother Nature’s problem with Alberta is, but I’m not happy with her. Oh, wait. I bet it’s the oilsands. Come around January, just about every Canadian is ready for a trip to Vegas or Hawaii. I’m starting to think that a full 72% of our debt problem is because people just want to warm up for a week or two, but lack the means to pay for it. I’m cold just thinking about winter, and it’s currently 28 degrees Celsius outside. Luckily for all of us, I have a strategy that will allow you to avoid winter forever, and will let you retire earlier than you could ever imagine. Sound too good to be true? It’s completely viable and achievable for even the average person. All you have to do is leave the country forever. Sounds easy, right? You should be striving for passive income no matter what, because it’s the main reason why wealthy people rise above the masses. This is especially important when you’re trying to relocate to a warmer country. Passive income can take many forms, using the web is probably the easiest. Start up costs are low, all you really need to invest is a whole whack of time. It’ll take months (if not years) of hard work to even get to the point of making a decent sideline income online. Once you do though, it’s the perfect business to run from another place. All you really need is a laptop and a decent internet connection. No wonder so many people are trying to make extra cash online. Or, you could go a more traditional route. By working more hours at your current job (or taking another) you can easily make an extra $10,000 per year. If you invest primarily for income, getting a return above 7% is quite possible with only taking on a bit of extra risk. If you commit to a goal of getting your expenses as low as possible, there’s no telling how much you can save. 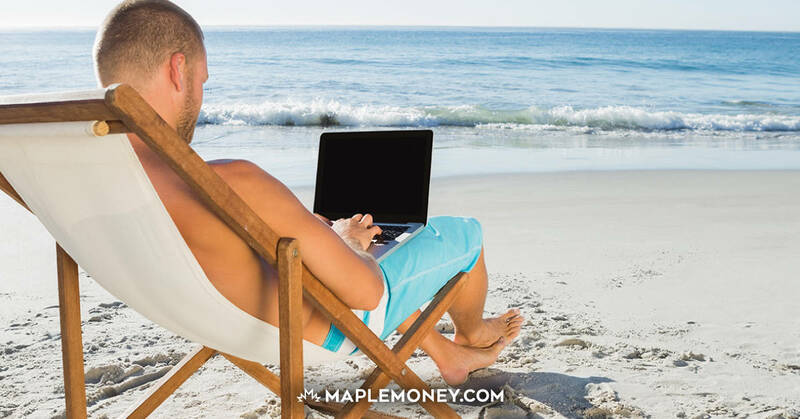 This strategy will probably take more years to implement than just making money online, but you could move and retire early. I’m not talking about a vacation property in the United States here. If you want to live cheaply, you gotta go further south. You might have to mingle with some non-English speaking people. Oh the humanity! Thanks to cheap living conditions in all sorts of different countries, living abroad is easier than you could have ever imagined. An income of $20,000 a year will allow you to live comfortably in countries such as Costa Rica, Mexico, Uruguay, Argentina, Brazil, South Africa or Malaysia. If any of those countries don’t fit your fancy, there’s a dozen more where living costs are cheap and the weather is warm all year round. Obviously, research is key before you go and pack your bags for a faraway land. I know a guy who looked at retiring in Costa Rica, so let’s look at it specifically. I could find hundreds of different properties for sale in the country for less than $100k American. Hiring locals to serve as cooks, maids or gardeners will only set you back a few hundred bucks a month. Local groceries are cheap. The country has a state ran health care system, meaning you don’t have to worry about medical expenses down the road. The country has a stable, democratically elected government. It’s not perfect, but it has definite advantages to Canada. If only it were as easy and packing up and moving. The fine people of Costa Rica (or any country listed) aren’t about to let you in just because you asked them nicely. Like Canada or the U.S., they have immigration policies. Retirees have it easy. Many countries create programs making it easy for retirees to relocate there, knowing your spending will help stimulate the local economy. A retiree will need a place to live, food to eat and medicine to extend their stay. Locals provide those services to them at a small fee, therefore strengthening the local economy. And since old people are usually lazy, they’ll hire locals to do their gardening and cleaning, further stimulating the local economy. You’ll have to research each individual country’s immigration policies before even thinking about relocating. For Costa Rica specifically, you have to prove that you’re making more than $1000 (US) a month, and that income will continue in perpetuity. Also, you have to prove on an ongoing basis that you’re spending your earnings locally. And since this has become somewhat popular, the local immigration offices have a backlog of applications. Patience young grasshopper. And why the rush anyway? You can head to whatever country strikes your fancy and preview it beforehand. Hang out on the beach and check out all the local sights, sounds and tastes. Maybe intentionally hurt yourself to see what kind of medical care you’d receive. Since they’re cheap countries to visit as well, a nice warm vacation might just be what Mother Nature ordered. Just make sure to go in January. It sounds very attractive, but I would be leaving friends, family and a familiar lifestyle never mind, I would need to learn a new language. Although I live in southern California where winter is not that tough, I may want a lower cost lifestyle. I would rather spend my time increasing my retirement savings or income than leave family and friends.